The Australian ‘Pathways to Market’ project involves targeted investigation into how intelligent use of information can contribute to enhancing industry competitiveness, environmental sustainability and innovation in food value chains. It is focused on supporting premium food companies to adapt to, and capitalise on, the significant business opportunities that are already emerging from rapid market changes occurring in the Asia-Pacific region. The project’s starting point is that numerous challenges continue to be faced by food companies wishing to grasp these emerging opportunities. Australian food businesses increasingly need to be able to validate the quality of their production processes in real-time, respond effectively to new regulations and tougher quality and safety requirements, adapt to changing consumer preferences and prove their credentials in meeting higher environmental standards through sustainable business practice. To investigate these challenges, one work-package in the project is conducting research into integrating food stability science, sensors and traceability to address value chain development in collaboration with a leading ‘premium beef’ company. Australia already has a number of systems in place for tracking and certifying the quality and safety of meat products and production processes. However, these processes continue to be heavily focused on the production end of the supply chain and there is limited integration of predictive models on sensor packaging to provide real-time monitoring, traceability and feedback along the entire meat supply chain. 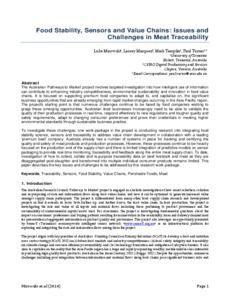 To date, investigation of how to collect, collate and re-purpose traceability data on beef livestock and meat as they are disaggregated post-slaughter and transformed into multiple individual consumer products remains limited. This paper describes the key issues and challenges to be addressed by this research work-package.